Microsoft’s Holiday Update for the Xbox One eliminates the need to organize a gaming session in your buddy’s den. Instead you can do it online, with a slew of social features designed to connect past and future friends. Microsoft began rolling out its so-called Holiday Update on Thursday, adding features such as Clubs, Looking For Group and other features to its network of Xbox One consoles and the Xbox app for Windows 10. If you don’t have it already, your box should be getting it soon. Microsoft announced some of these features at its E3 presentation in June, introducing them into the Xbox Preview Program a bit later. That latter program has been renamed the Xbox Insider Program, similar to the Windows Insider Program, and is now available to all. Special rare Xbox Achievements are now designated with a (slightly hard to see)diamond. You’ll also be notified in-game of your accomplishment. Why this matters: Virtually all of the new updates are designed to make the Xbox a more social experience. Previous updates have allowed players to seek out Facebook friends and their gamertags and add them to their friends’ network. It’s no surprise that the Xbox app on Windows 10 is a central point for all of this: The app has quietly evolved into the closest thing to a social network that Microsoft provides. The new Clubs function takes the social aspect a step further. Both Clubs and Looking for Group borrow conventions from games such as World of Warcraft, bringing together like-minded gamers for joint gameplay. 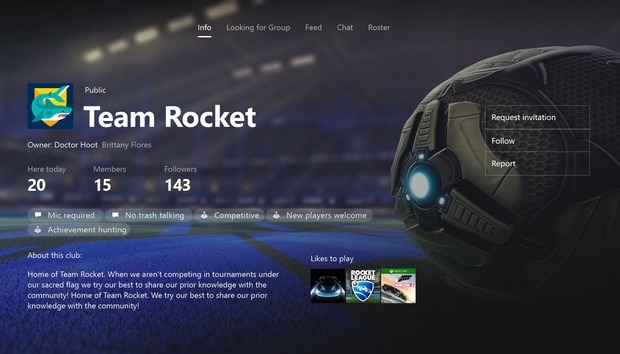 Clubs are simply player-managed groups of gamers that can share parties and content, including text and voice chat among the Xbox One and Xbox app. A related Group Messaging feature allows you to communicate with a bunch of gamers, regardless of whether they’re in your Club. Group Messaging allows you to contact a number of friends (or foes!) and let them know what’s up. Looking for Group is slightly different: Here, gamers can seek out pubbies (public gamers, sometimes also called "randos" for random gamers) to play a particular game. The LFG organizer can set constraints on the game, the language spoken, whether trash-talking is allowed, and more, then choose buddies. Microsoft also added ways to distinguish yourself from others. A new Achievement Rarity metric awards special “diamond” achievements to players who accomplish something fewer than 10 percent of the other game’s players have. A modified Leaderboard (viewable by any Xbox friends online), tracks your progress over the course of each month. If you need to let a friend know that they need to catch up, the new keyboard now includes emojis. There’s no need to join a Club, of course. But if you’re finding it harder and harder to connect in real life for a gaming session, at least there’s an online alternative.